The boss secretary filter allow to set a secretary or a boss role to a user. Filters can then be created to filter calls directed to a boss using different strategies. The secretary or boss role can be set in the user’s configuration page under the service tab. To use this feature, at least one boss and one secretary must be defined. The filter is used to associate a boss to one or many secretaries and to set a ring strategy. The call filter is added in the Services ‣ IPBX ‣ Call management ‣ Call filters page. When one of serial strategies is used, the first secretary called is the last in the list. The order can be modified by drag and drop in the list. The call filter function can be activated and deactivated by the boss or the secretary using the *37 extension. The extension is defined in IPBX services > Extensions. 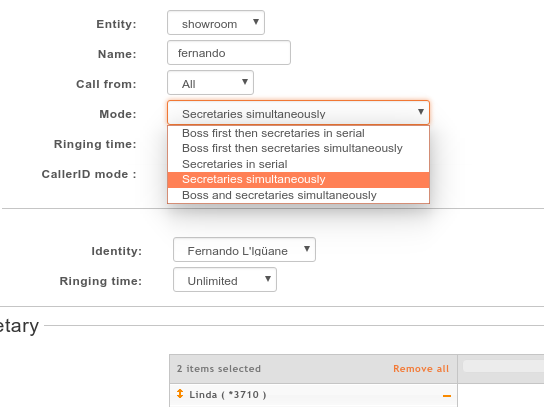 The call filter has to be activated for each secretary if more than one is defined for a given boss. The extension to use is *37<callfilter member id>. In this example, you would set 2 Func Keys *373 and *374 on the Boss. On the secretary Jina LaPlante you would set *373. On the secretary Ptit Nouveau you would set *374. A more convenient way to active the boss secretary filter is to assign a function key on the boss’ phone or the secretary’s phone. In the user’s configuration under Func Keys. A function key can be added for each secretaries of a boss. If supervision is activated, the key will light up when filter is activated for this secretary. If a secretary also has a function key on the same boss/secretary combination the function key’s BLF will be in sync between each phones. With SCCP phones, you must configure a custom Func Keys.